Proving by induction that an equilateral triangle will always be divided into (n+1)^2 small triangles? Let $n$ be a positive integer. Given an equilateral triangle, place $n$ points on each side, dividing the side into $n+1$ equal segments. Use the points to draw $n$ line segments parallel to each side of the triangle ($3n$ line segments in all). Prove by induction that this will always divide the triangle into exactly $(n+1)^2$ little equilateral triangles. But I am unsure of how to proceed past the base case. 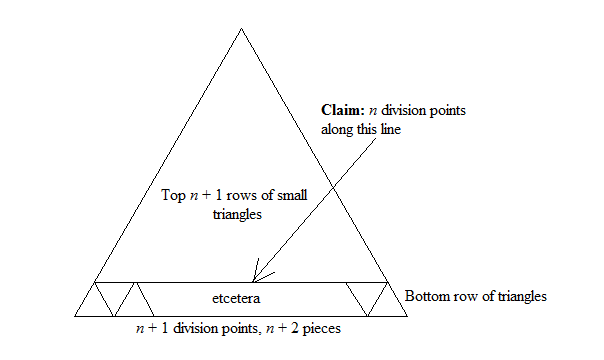 HINT: Your induction hypothesis is that when you divide the triangle with $n$ points on a side, and have $(n+1)^2$ small triangles. You want to show that when you divide it with $n+1$ points on a side, you get $(n+2)^2$ small triangles. Imagine that you’ve divided it with $n+1$ points on a side. Show that if you ignore the bottom row of small triangles, the rest is an equilateral triangle that has been divided with $n$ points on a side. (You just have to check that its bottom edge has been divided with $n$ points into $n+1$ pieces.) By the induction hypothesis there are then $(n+1)^2$ small triangles above the bottom row of small triangles. Now show that the bottom row contains just enough small triangles to make up the difference between $(n+1)^2$ and $(n+2)^2$, i.e., $(n+2)^2-(n+1)^2$. If you split sides of $\triangle ABC$ in $n$ parts, then $\triangle AB'C'$ is a triangle whose edges were splitted in $(n-1)$ parts. Not the answer you're looking for? Browse other questions tagged geometry discrete-mathematics discrete-geometry or ask your own question. Is it possible to divide an equilateral triangle into 12 congruent triangles? How to prove $XP = X'P$? Proof: The number of unit equilateral triangles that form a larger equilateral triangle is a square. Solving a recurrence relation in series of triangles.